Oven baked fish and chips allows you to indulge without sacrificing tons of calories. This un-fried version of fish and chips has less calories than the traditional dish and is healthier for you too. This recipe uses corn flake crumbs as opposed to bread crumbs to give the fish a crispier crust. 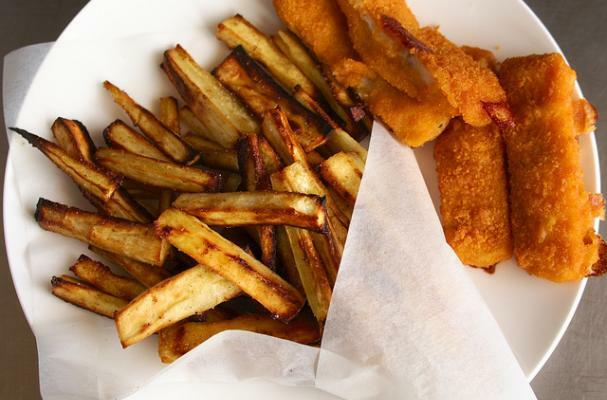 Serve your oven baked fish and chips with tarter sauce and malt vinegar. 1. In a medium bowl, combine oil and pepper. Cut potatoes lengthwise into 1/2-inch strips. Add to oil mixture; toss to coat. Place on a 15-by-10-by-1-inch baking pan that has been coated with nonstick cooking spray. Bake, uncovered, at 425 degrees for 25 to 30 minutes or until golden brown and crisp. 2. Meanwhile, combine flour and pepper in a shallow dish. In a second dish, beat egg substitute and water. In a third dish, combine cornflakes, cheese and cayenne. Dredge fish in flour, then dip in egg mixture, and coat with crumb mixture. Place on a baking sheet that has been coated with nonstick cooking spray. Bake at 425 degrees for 10 to 15 minutes or until fish flakes easily with a fork. Serve with chips and tartar sauce.